Rarely do we feature non-butterfly articles on this blog. But occasionally, we do make some exceptions when deserving stories such as the one on the While Bellied Sea Eagle was featured some time back. 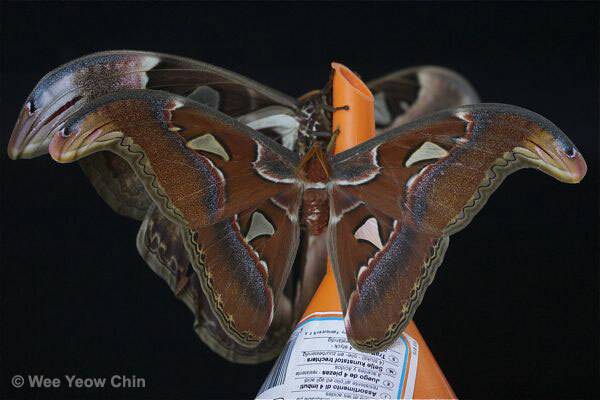 This time around, we feature Dr Wee Yeow Chin's encounters with the largest moth in the world, the Atlas Moth (Attacus atlas). Dr Wee Yeow Chin is a fellow blogger and a good friend and supporter for many years. 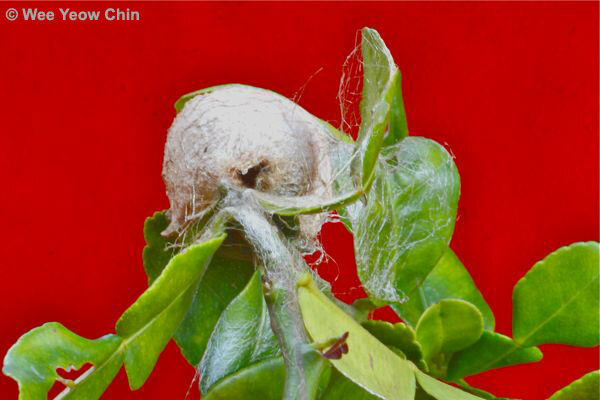 He is a prominent botanist and popular academician who taught at the Department of Biological Sciences at the National University of Singapore until his retirement in 1997. 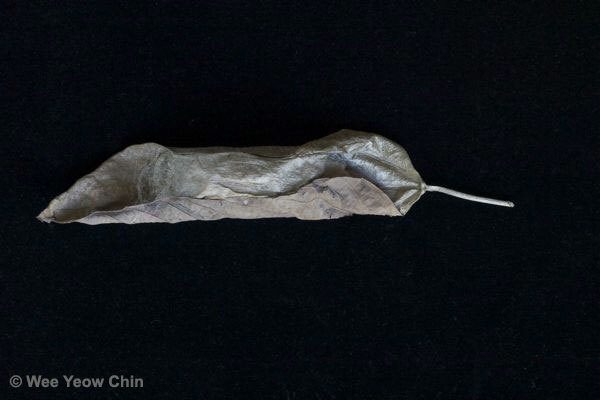 He was also the founding President of the Nature Society of Singapore back in 1991. In recent years, he set up the Bird Ecology Study Group (BESG) as an alternative group to share information and document the behaviour of birds. Today, the BESG stands as an independent group that is popular amongst bird-watchers all around the world and the blog contains a treasure trove of information par excellence in the study of birds in their natural environment. 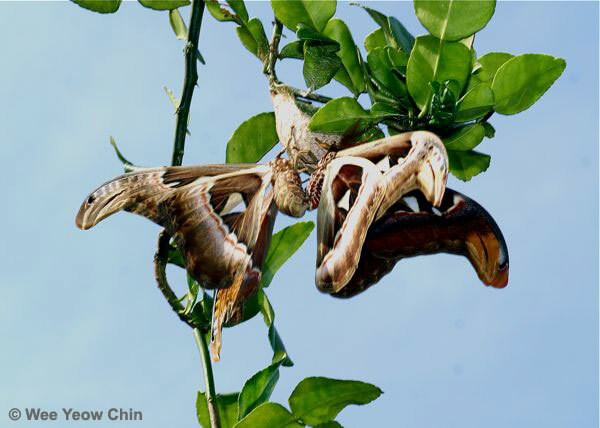 The first time the Atlas Moth (Attacus atlas) got my attention was when about two dozens individuals were seen attached to pupal cases on my Limau Purut (Citrus hystrix) tree. I failed to notice the caterpillars when they were munching on the leaves. I failed to notice the pupae when they developed on the tree. 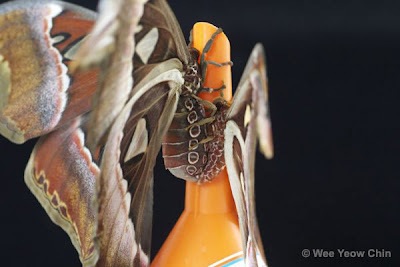 Only when the large moths emerged from the pupa cases and hung out did I finally take notice. 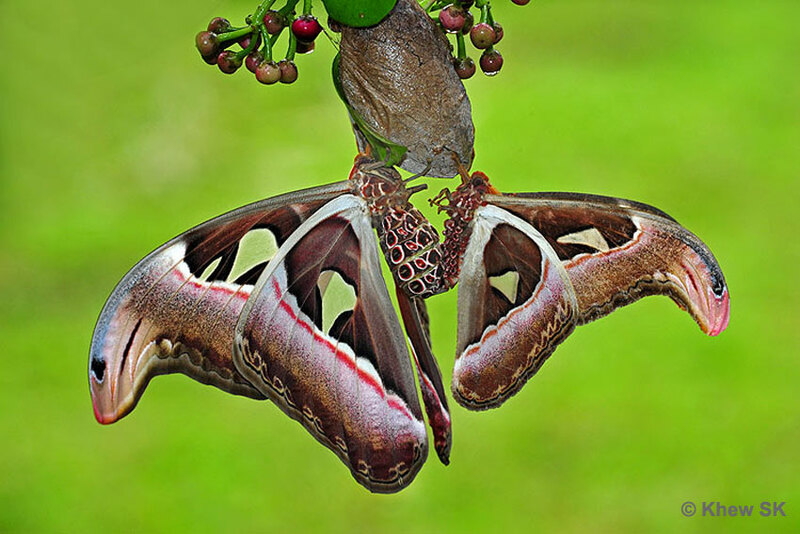 Most of the moths were in pairs, each pair clinging together from a pupal case. I failed to question the significance of this. I was simply awed by the presence of these large moths. Seeing the silky cases, I was puzzled as to how these large moths managed to get out of the cases. 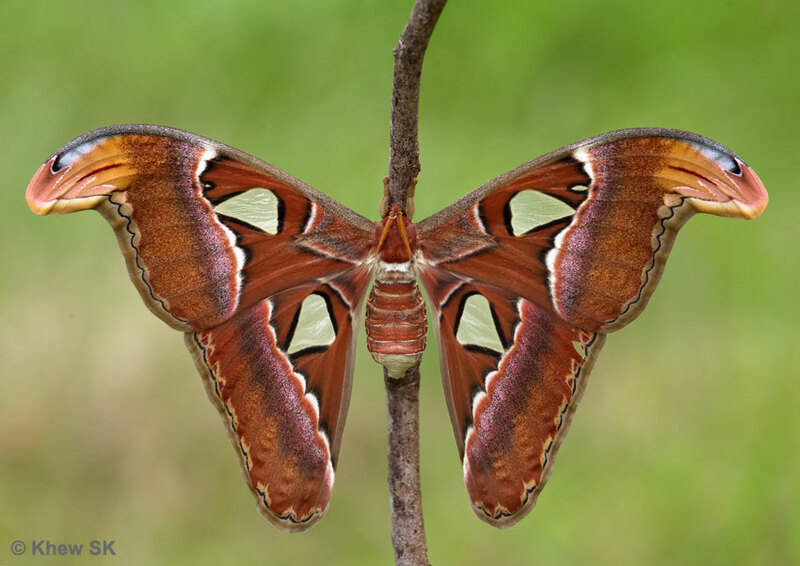 The cases remained intact except of a small opening at one end but how would it be possible for such a large moth to crawl out of such a small opening? I asked around but failed to get a satisfactory answer. And every year since then, I kept watch on the tree hoping for the return of the caterpillars so that I could get an answer to the puzzle. But the tree was never infested with these caterpillars ever since. My next encounter with the Atlas moth was seven years later. And that encounter saw me breeding two generations of caterpillars before I finally got answers to my questions. In December 2011 I picked up a discarded pupa wrapped round a dried blue Mahang leaf (Macaranga heyeni) on the ground below the tree in my garden. Curious as to what it was and hoping to keep it as a specimen, I left it on a bench in my porch. 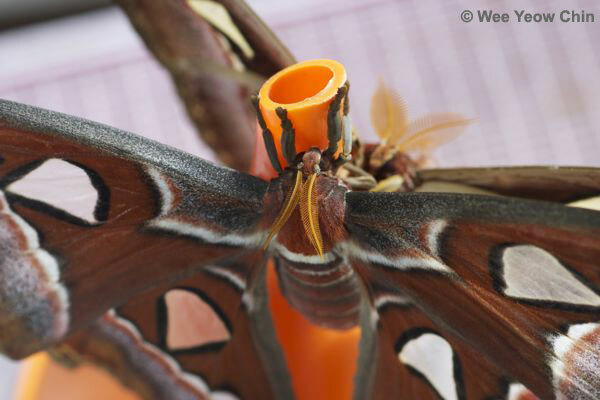 Imagine my surprise when a few mornings later I found a pair of large Atlas Moths clinging to the spout of a nearby upturned funnel. The body of one was larger than that of the other and the tips of their abdomens were in contact. The size difference of their wings was only slight, with the tips of the forewings narrowing to a point, each with an eyespot. The antennae of the pair were also different. 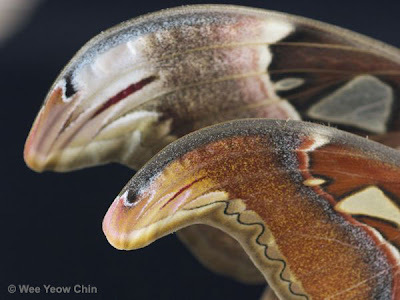 The wing tips of the Atlas Moths' wings - reminescent of a snake's head? The smaller moth had wider antennae while the larger one narrower. I was to find out later that the female moth is larger and has narrower antennae. 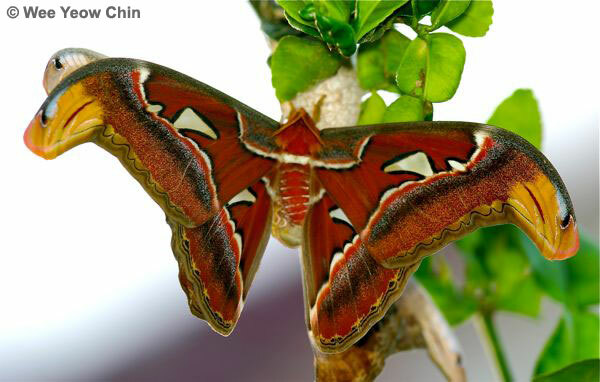 The male moth on the other hand is smaller but with wider antennae to enable it to detect the pheromone released by the females from some distance away. Fascinated, I photographed the pair, moving the funnel around for better positions. The moths remained attached all the time, never attempting to fly off. The pair was then placed inside a cage where they remained attached together until the next morning when they disengaged. 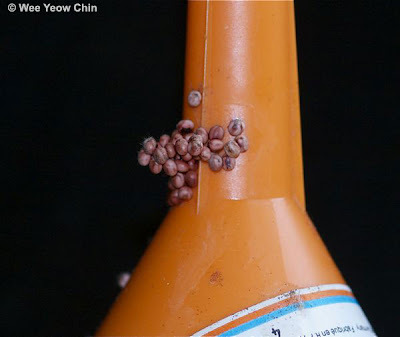 On the funnel were clumps of small oval eggs, each 2.5 mm long and 2 mm wide, numbering about 250. The moths were then released and the eggs transferred on to the leaves of a Limau Purut twig taken from my garden. By then I was obviously aware that this is one of the host plants of the caterpillars. For the next six months I was totally engaged in breeding these caterpillars that was to eventually lead to the answers of my questions. I was to realise that the discarded pupa actually had a live caterpillar in its final stage of metamorphosis inside. And that the moth that emerged was actually a female. 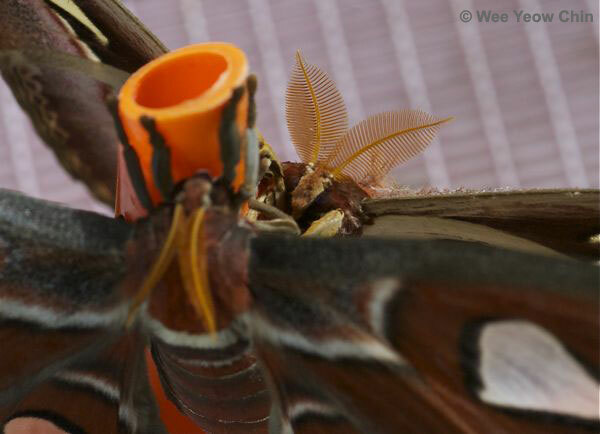 The female moth somehow crawled on to the spout of the upturned funnel where it spread its wings to dry and during the night attracted a male that flew in to copulate with it. However, the puzzle as to how the female moth emerged from the pupil case was to elude me until very much later when I finally managed to document the process after numerous failed attempts to be at the right place at the right time.